New screenshots from a preview build of the upcoming Fall Creators Update for Windows 10 have shown off the new Mixed Reality Viewer app, giving us a glimpse of what Microsoft plans for supporting the range of mixed reality headsets which are due to launch alongside the update on October 17. The images, posted on the Aggiornamenti Lumia blog, show how the existing View 3D app has been rebranded into the Mixed Reality Viewer. It allows users to open 3D models inside Windows 10 and view them with a mixed reality headset, or through a standard 2D monitor. The screenshots of the app were taken on a computer running Windows 10 that's been signed up to the Insider’s Program with ‘Fast Ring with Skip Ahead enabled’. This gives users a chance to download an early version of upcoming Windows updates to test out before they are finished. The blog post explains some of the new features of the Mixed Reality Viewer app, including a new logo and interface. These images show how mixed reality content will be handled in Windows 10 in the future. While it hasn’t been explicitly confirmed to feature in the Fall Creators Update, we’re hoping that it will be included, or shortly afterwards. The blog also hosts a download of the new app for people to try out, but we'd recommend holding fire and waiting for the final version to appear on the Windows Store in the future. 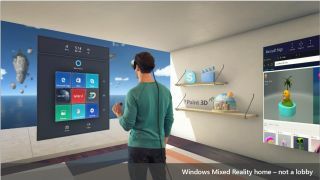 Microsoft has made a big deal of supporting mixed reality, so to have a flagship app included in its next major update of Windows 10 will be a good indication of just how serious it is about MR.